Whether you're a New Zealander taking a break from the hubbub of the city, or flying in from a world away, we hope you'll find our apartments, on the edge of New Zealand's beautiful Abel Tasman National Park, an ideal choice for your holiday escape. Marahau is in the Tasman region of New Zealand's South Island. We're only 18km north of Motueka or an hours comfortable drive from Nelson Airport. If you've travelled across to Picton on the ferry, we're a scenic 3 hours drive away. 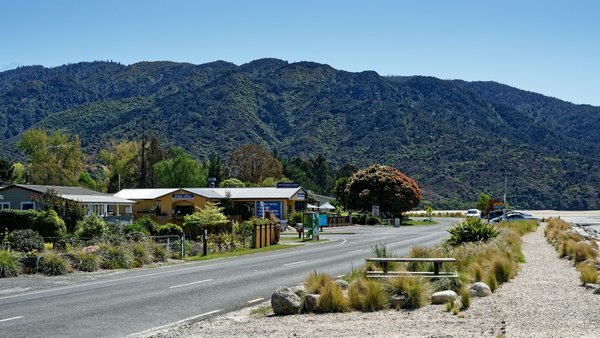 Either drive through Kaiteriteri or over the Marahau Hill to get to Marahau, our small community is nestled at the start of New Zealand's Abel Tasman National Park. You can start the Abel Tasman Coastal Track Great Walk from Marahau or just venture into the park for a day. There are local cafés in Marahau so stop for a cup of coffee, a glass of wine or something to eat. You can also hire a water taxi or kayak to explore the Abel Tasman. Enjoy just sitting on the waterfront watching the world go by or take a swim. Or bring your own food back and enjoy your own tasty creation with a glass of Nelson or Tasman wine on your veranda planning your adventures for tomorrow. 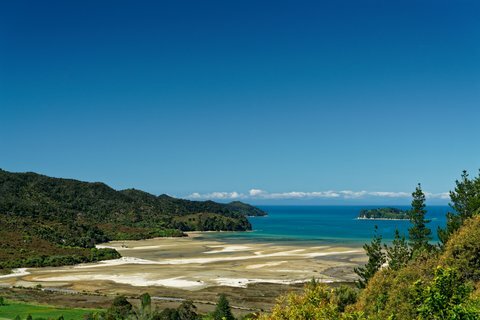 The Abel Tasman is world renowned for its golden beaches and blue-green waters. The Abel Tasman Coastal Track is classified as one of New Zealand's Great Walks - it is lovely as it drops down into inviting golden bays, ideal for a swim after a few hours walking. If you don't have time for a multi-day walk, why not take a picnic and relax in one of the bays? Look out for the bird life along the way, several endangered/threatened species of New Zealand birds (including saddleback and kaka) have been re-released into the park and you may spot one. You will most likely also see fantail, weka, South Island robin, tui and bellbirds. You can hire a water taxi or take a cruise to see more of the Abel Tasman's coastline (look out for New Zealand fur seals, penguins, bird life and if you're lucky dolphins & orca along the way) or visit the marine reserve. Or hire a kayak (either guided or free touring), go paddle boarding, try kite surfing, or enjoy a horse ride along the beach. 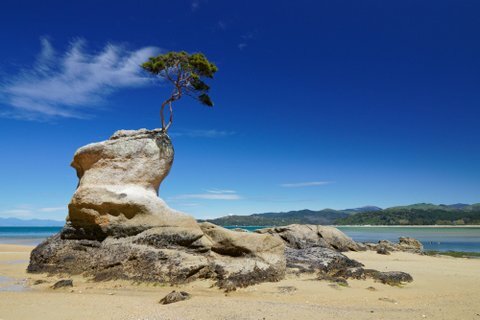 The Abel Tasman is New Zealand's most accessible national park, so if you'd like to have a look at one of New Zealand's national parks, then this is an ideal one to visit. If peace and solitude are not for you then there are plenty of tourist activities available throughout the Nelson and Tasman regions. As well as the Abel Tasman there are also Kahurangi and Nelson Lakes national parks to explore. Or you could visit the regions wineries and vineyards. Try paragliding or a tandem skydive in nearby Motueka and visit Motueka's Sunday Market. 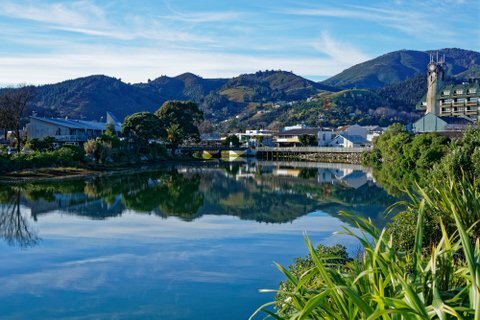 Nelson is a vibrant town with everything the visitor could want...and then some! The Saturday morning arts and craft market is a particular focal point. There are also golf courses and antique shops in the area, so enjoy your day out, maybe venture over Takaka Hill and visit Golden Bay, and return to your own, self-contained holiday home. Make sure you pack a large storage card, as round every corner there is something magical waiting. You will understand why some of The Lord Of The Rings was filmed in this part of New Zealand, around Canaan Down, Golden Bay and Mount Owen in the Kahurangi National Park. Don't forget to visit the Word of Wearable Arts Museum when in Nelson to see many of the winning entries. One thing's for sure - you won't want to leave! The Buena Vista apartments are situated in a breathtakingly exotic landscape surrounded by a unique bird life overlooking the Bay. !! You'll wish you had more time to visit this beautiful part of New Zealand. Base yourself in Marahau and explore all this part of the South Island has to offer. You won't want to go home! Visit the Tasman & Nelson Region soon.